For the second round of the 2018 Formula 1 world championship the circus travelled to Bahrain with the Sakhir International Circuit presenting a very different challenge to Albert Park. Since changing to a night time event cooling requirements have been eased slightly but the region’s warm climate means that the power unit and tyres are a little more sensitive to the higher ambient and track temperatures. Car modifications generally include opening bodywork to vent latent heat from around the coolers, while the drums surrounding the hubs are adjusted to direct heat generated by the brakes through the open face of the wheel rim, reducing tyre warmup. Brake temperatures can also be quite marginal given the long straights followed by tight corners, as shown by Max Verstappen’s failure last year following his pitstop. Despite the challenges, the Bahrain Grand Prix is a welcome event from a technical perspective as it is the first conventional venue on the calendar, providing teams with a better opportunity to assess their package and continue to add new bits that may not have made it to the car for testing or the opening round. The F1 paddock then immediately marches on to Shanghai and the Chinese Grand Prix. Although climatically very different the Shanghai track has similar characteristics to Sakhir, with sweeping corners and long straights that punish cars that produce a lot of drag. It is therefore unsurprising to see teams prepare a small aerodynamic package that covers both events. 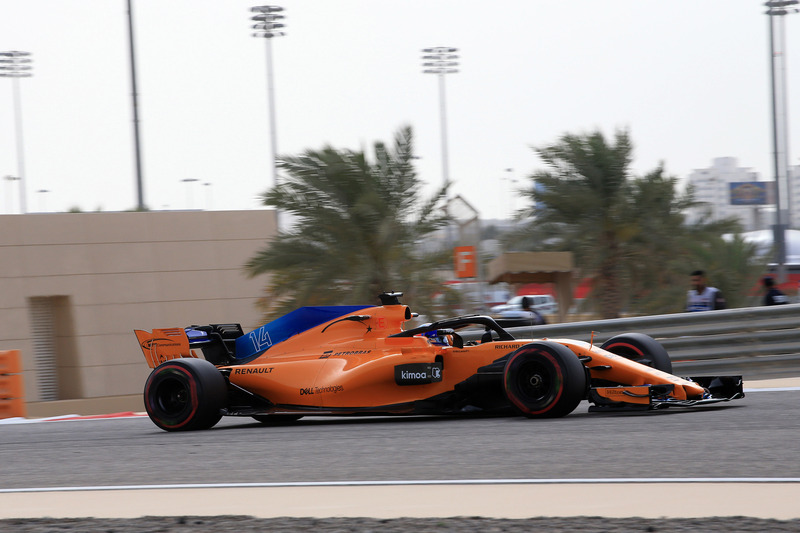 The team’s much talked about bargeboard update was available to Fernando Alonso on Friday in Bahrain, who conducted a Flo-Vis assessment and back-to-back tested it with the previous solution during FP1. The revisions focus on the deflector baffle that is braced to the sidepod shoulder: gone is the S-shaped vane (or ‘aero cat’ vane, as dubbed by Renault) and in its place is a larger – but still quite small by 2018 standards – rectangular baffle. The baffle is split in two, with a smaller leading edge piece and a larger curled device behind. Interestingly, unlike almost all of their rivals, the baffle is no longer connected to the bargeboard or floor below. This is a surprisingly minimalist approach to this region of the car, lacking in complexity compared to the front runners and even others in the midfield. However, there is little reason to suggest that McLaren haven’t grasped this area properly given the intricacies of the car elsewhere (such as the front wing). The MCL33’s sidepods are narrower than most and therefore require less protection against the turbulent wake of the front tyre. Perhaps the vortexes that are shed from the front wing could be doing such a good job of carrying away the wake that there is no need for a multi-vane array that the likes of Red Bull have. Their modest design will offer reduced drag and a small weight saving compared to other solutions. Also making its debut on the car, a slender T-wing ahead of the underside of the rear wing. Consisting of just a single element, it will work in conjunction with the air flowing over the rear wing and out from under the floor to induce a tiny bit more downforce across a wide speed threshold. McLaren appear to be adopting a similar development approach that Red Bull used last year, adding to the car incrementally as they learn about its performance. A larger update package, dubbed as T2, is expected for Spain, which includes a new nose – this should incorporate an S-duct outlet that links to the inlet at the base of the front bulkhead run throughout the year so far. Having brought a sizeable upgrade to Melbourne, Force India continue to bring parts that should help lift them back to where they left off last season. In Bahrain the team could only muster one new front wing which was trialled by Sergio Perez. However after running it in free practice the team concluded that the wing was not performing as expected and that both drivers will revert back to the old specification for the rest of the weekend and also in China. The new wing is very much an evolution of their already very intricate design, the modifications compiling ideas from a number of teams. Starting with the main plane, the leading edge has been curled at the Y250 junction (arrowed) in a similar fashion to Ferrari’s, driving air below the wing to provide more downforce. Two of the upper flaps have been subdivided at the inboard section (circled) to fine tune the strength and/or stability of the Y250 vortex. 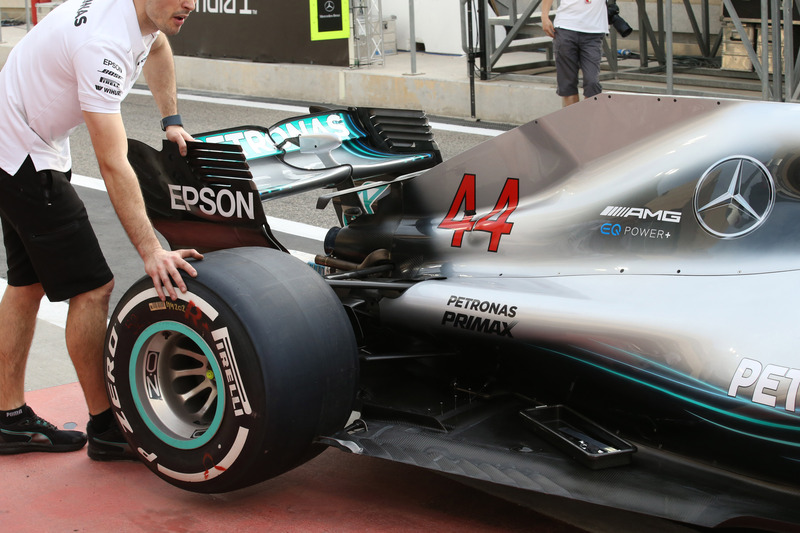 Teams are always looking to improve this critical aerostructure, which is responsible for governing the air around the bargeboards and carrying away front tyre wake as it spirals down the length of the car. Finally, the cascade winglet has also received a tiny tweak. The R-vane (named so due to its shape when viewed from the side) that acts as an endplate to the winglet has been opened to the oncoming airflow a little bit more. The sum of these small adjustments aim to provide an overall positive influence on how the air flows over the car. 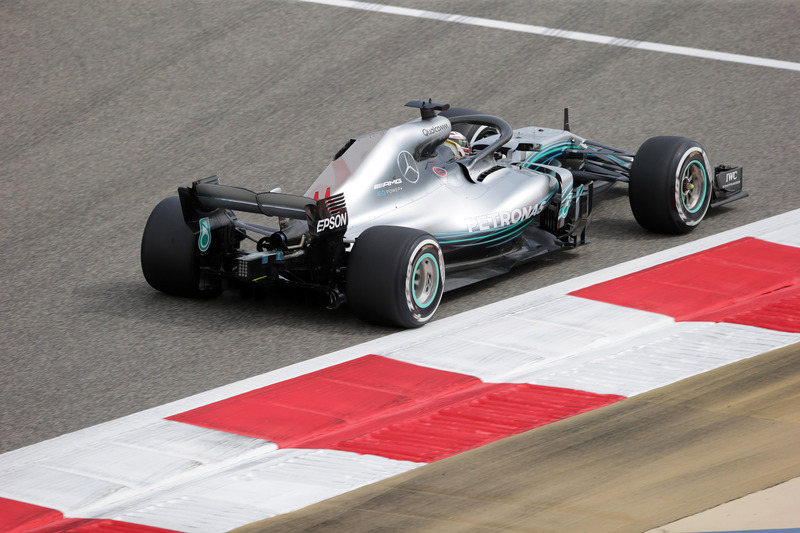 Mercedes don’t tend to show their hand with developments during the opening rounds of the season, only bringing circuit-specific items to ensure that their car performs optimally. Last year we saw the team bring a vented engine cover to Bahrain, creating a chimney through the top of the shark fin and using the fast flowing freestream air above to draw heat out from within. 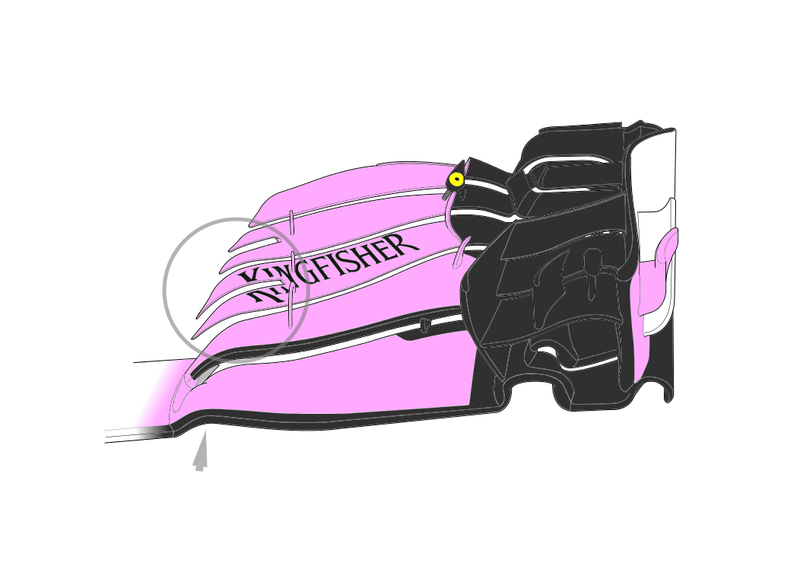 For 2018 they have introduced a similar design, although with the shark fin now banned the chimney opens at angles along the periphery of the engine cover. You can also see in the above photo a series of bolts that line the engine cover’s spine. These are to fix a number of small fences that separate the opening, just to control how the hot air is pulled out from within the car. 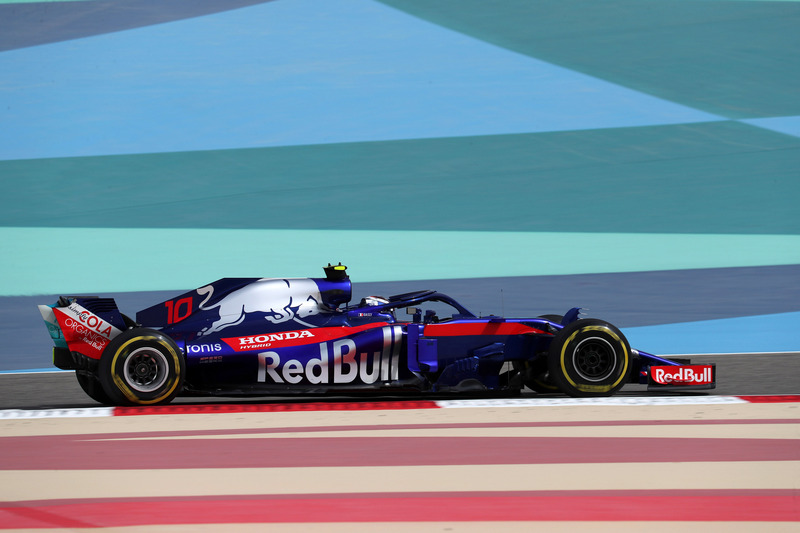 It will be interesting to see how Toro Rosso get on with development this season – not a lot of focus has gone into the aerodynamic surfaces since the switch to Honda power, but the first sign of progress have become visible. Although not vastly different to the outgoing version, the bargeboards on the STR13 are now firmly aligned with the rest of the grid. The primary board features a series of vertical slots to carefully filter airflow between both sides, reducing flow separation and managing how the vortex it produces is shed. The footplate has also had some attention, with lipped serrations replacing the previously blank surface. These will help seal the floor line of the car from sudden disturbances in the flow, improving both downforce and cornering consistency. China has been a good hunting ground for title rival Mercedes, but Ferrari have reason to feel confident with their 2018 car given that their power unit appears to be a good match. To help compete against the Silver Arrows the Scuderia brought a new rear wing to suit the low-drag characteristics of the Shanghai International Circuit. The wing features a spoon profile, a typical solution to tackle the age-old problem of downforce versus drag – the main plane’s deep central section has a higher angle of attack to induce low pressure, while the outboard section is far shallower and presents less frontal area to the oncoming flow. The horizontal louvres in the endplate are also open at the leading edge, allowing air to migrate more freely between the two sides to reduce the size and strength of wing tip vortices. 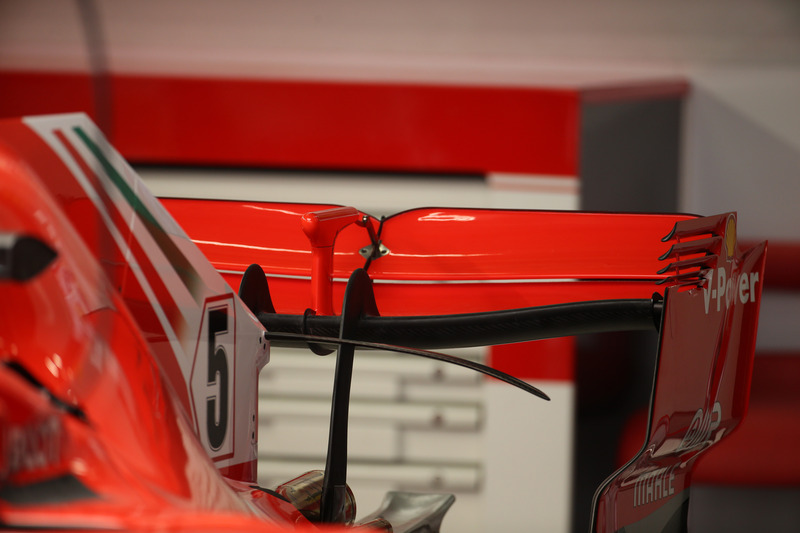 Ferrari had a similar design in 2017 for other low downforce venues, but this year’s wing continues to utilise the twin swan-neck supports that straddle the exhaust to maintain good quality airflow under the main plane.